Pulled into the Winn Dixie parking lot and spotted the rear of a nice looking red AP1 parked between a couple other cars. "Oh," thought I, "I haven't seen that one around. And, look, it has a Harrison County tag." Then I pulled in to a parking slot a couple spaces down, got out, looked, and....ohhhhhhhhhhhhhhhh. Just ahead of the original never-curbed front 16" wheels on this otherwise clean Formula Red S2000 were headlights adorned with huge "eye lashes". Should I have been upset? I mean it's that person's car and those eyelashes were no worse than a hela-flush stretch look on a slammed-to-the-ground S (at least in my mind) and far less permanent. But deep inside I was upset. Not "How could the refs miss that pass interference call and keep my Saints out of the Super Bowl" upset. More like seeing the "Celebrity Brain Crash" routine on the forth episode of The Grand Tour and wondering, "Are they going to repeat this stupid joke on every episode?" (Answer; Yeah, until they came to their senses in Season 2.) Upset enough to come on here and rant about the whole thing. In the words we have all heard from our parents at one time or another, I wasn't mad, just disappointed. So was this styling touch OK? Was this owner perfectly within her rights to make her sports car a little more her own? 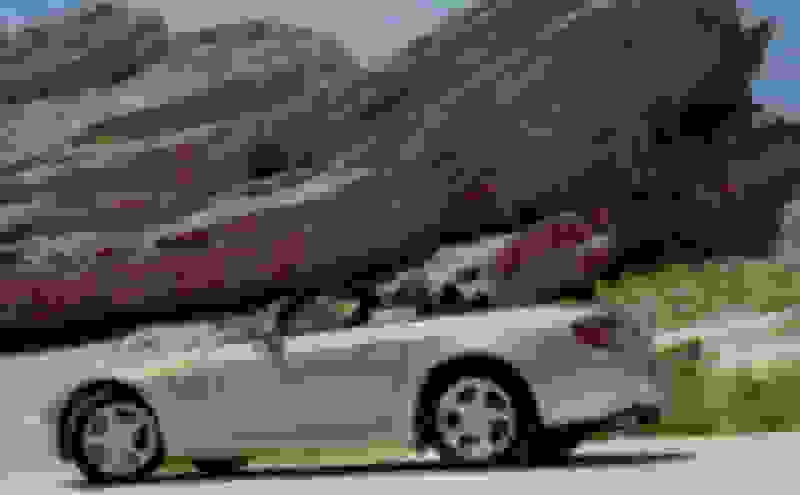 Or was she committing some kind of automotive blaspheme by adorning an S2000 with a styling gimmick straight out of the VW section of a J.C Whitney catalog? Somebody tell me to get over it, that I'm probably just jealous because I don't have an S2000 any more. Or tell me that my disappointment is truly just and righteous. Or just tell us what stupid or funny things you have seen on an S2000. You need time to get over this...it's just so very sad! We've seen a few S2000s that truly make us shake our head and wonder why folks would take such extreme measure to make a thing of beauty look so damn stupid. Car guys (and gals) know when true beauty when they see it. No need to put a ton of lipstick on something that is already lovely right out of the showroom. 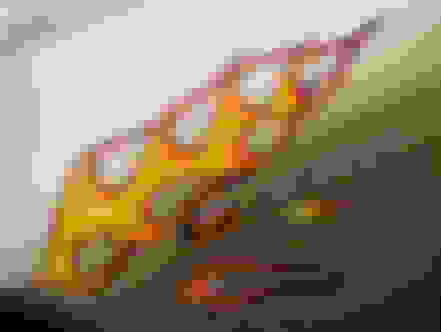 People did that to Bugeye Sprites for decades. Get over it. They come right off. I’m in the disappointed camp. It’s not a VW Beetle. I have seen a big fake wind up key on the back of VW's. 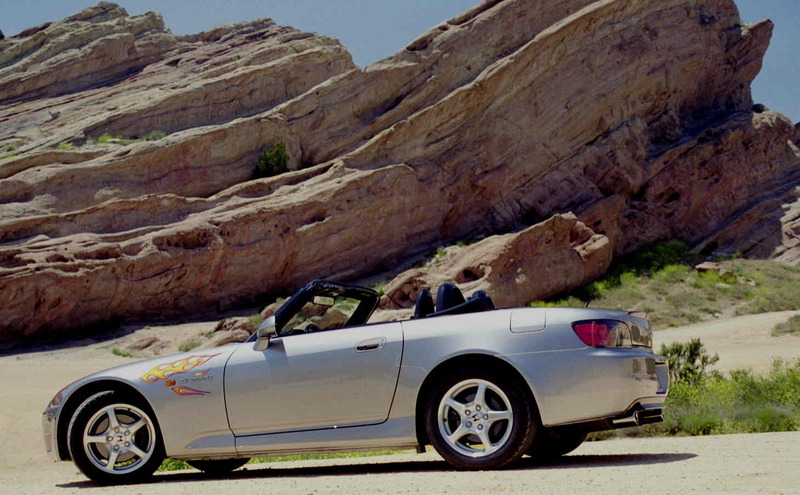 A pink S2000 in one of the Fast & Furious movies and a tiger tail hanging out of the back of a 67 GTO. No big deal, it's not my ride. BTW, on your other disappointment Roger Gooddell held a press conference today admitting to the blown call by the official in the NO/Rams game but covering his a$$ at the same time about some BS that officials are only human and make mistakes. I agree that eyelashes are ridiculous on an S but I forgive a female for wanting to say a girl owns the car (we assume). I feel more unhappiness when I see rolled fenders. Fake eyelashes come off unlike body alterations. 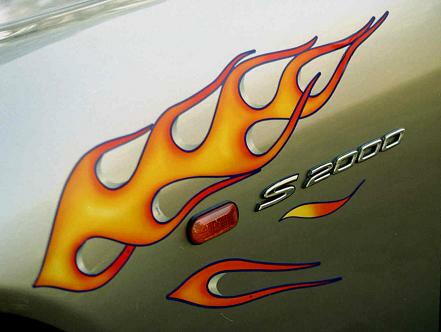 When I first had my S2000, a 2001 Silverstone, I bought some magnetic flames as a joke. I never drove with them on it but I took photos of the car with them on it and I thought they were funny. I ended up giving them to brantshali for his Miata. I'll dig up a photo when I'm on my PC. ^4-14-2003. At Vasquez Rocks, in Agua Dulce, California, ten miles from my house in Acton, CA. Last edited by Kyras; 01-31-2019 at 07:46 AM. I never, never thought about an S being feminine. I'm with you eyelashes are totally wrong. Reminds me of many years ago, not real long after I got my S. I wanted to personalize my car, my choice was Wet Okole seat covers in a Hawaiian print. I simply can't relate the sheer number of times that I was chided for destroying the "sports car nature" of those seat covers. That started about 19 years ago, and while I haven't been called various silly names in the past 15 years, I do still have those neoprene covers on my "pristine" OEM seats, and I will probably keep them on for the rest of my tenure with the car. The person that added eyelashes has not defiled the car, but has simply made their own. That said, I would probably find it odd at best.